CU is only offered by Fannie Mae. CU does not issue credit decisions. CU does not provide an estimate of the value. CU identifies risk factors using a numerical risk score of 1.0 to 5.0 and returns a message, or flag, which specifies the aspects of the appraisal that may need further attention. The analysis provided by CU is for exclusive use by the lender and may not be used in a way which may interfere with the independent judgment of the appraiser. Lenders are not allowed to provide any CU report to the appraisal management company or appraiser according to the CU licensing terms. Appraisers who provide accurate data to make their valuations should not feel a negative impact as a result of the implementation of this tool. CU is provided at no cost to lenders and is a voluntary tool available to Fannie Mae-approved lenders. It was created to provide an automated appraisal risk assessment to help lenders more effectively judge the quality of the appraisal. 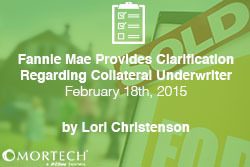 Additional information is provided through Lender Letter LL-2015-02, which is available on the Fannie Mae website.